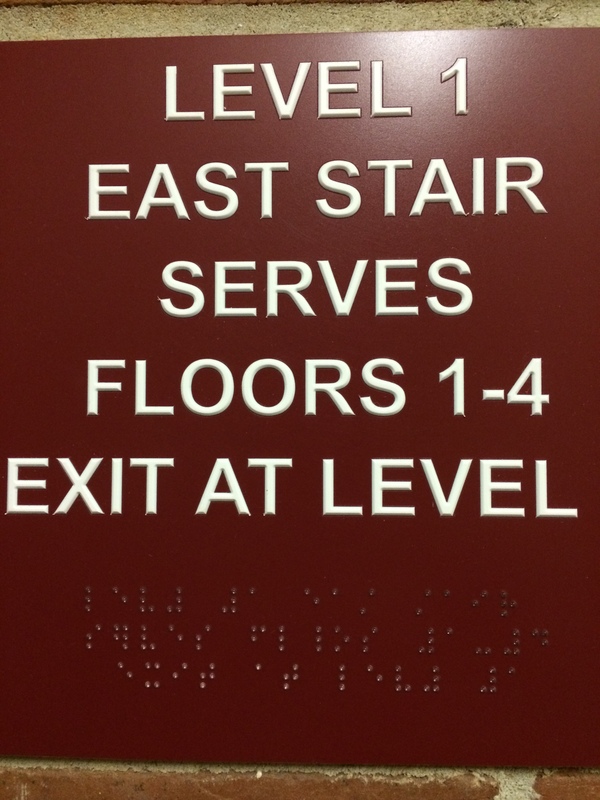 Braille Fail – Where is the Exit? I have been in this college classroom building for many years. I also took courses for my major in this building many, many years ago. I would not be surprised if this same sign was there and no one ever checked the braille. Does anyone know enough old code to confirm the two ? ?, 4-5-6 ow, was a contraction for ‘oors’ or that ‘ble’ was once a contraction for ‘el’? I am guessing these were really errors, but you never know! I was there so long ago the building wasn’t built yet. Those symbols were not part of the Braille we learned in the 1970s before that building existed. I think they are just errors. I’ve heard of grade 3 highly contracted Braille, such as dot 5v equals the word “love”, but I wouldn’t think those “contractions” would have existed in grade 3 or that grade 3 would have been used on posted signs. I DO read posted braille, always, and have discovered multi-word named rooms written in all caps with no spaces between the words, room numbers posted incorrectly right beside the print, and directions for a walk up ATM installed upside down. Yep, Becky – it is amazing how the campus has grown. I doubted the ‘old braille’ theory but wanted to put it out there just in case.